Crawley Town head coach Dermot Drummy is planning to make changes for tonight’s Checkatrade Trophy match away to Southampton Under-23s. 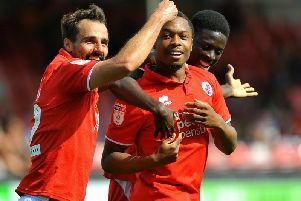 Reds are already through to the knock-out stage having already beaten Colchester United 1-0 and Charlton 2-0. But they need at least a point to make sure they finish top of the group and claim a home draw in the next round. Drummy said: “All the injured are going to get a run-out. “My thoughts are let’s give them a game with my mind on the Cambridge game. “We’ll just go and play our game - there’ll be no strategic thing of getting a draw. Drummy believes he has the players to match the ability of the Premier League club’s youngsters. He said: “We have technical players. We have seen a move from (Billy) Clifford and (James) Collins you would see in the Premier League and it will be the same kind of thing on Wednesday. Among those likely to feature are new signings Conor Henderson and Sanchez Watt plus Matt Harrold, who played his first competitive football since August coming off the bench against Bristol Rovers.